Homeland Security chief Janet Napolitano recognizes the threat of violence from the Mexican drug war poses for the U.S., particularly for border states like Texas and Arizona. WASHINGTON — Aiding the Mexican government’s fight against drug cartels is a top priority that demands the “utmost attention” of U.S. security officials, Homeland Security Secretary Janet Napolitano said yesterday, announcing new steps aimed at preventing the spillover of violence into the United States. Mexican President Felipe Calderón’s sweeping crackdown on narco-traffickers has triggered a desperate backlash of violence “of a different degree and level than we’ve ever seen before,” Napolitano said in her first appearance before the House Homeland Security Committee. “It is something that deserves our utmost attention right now,” she said. 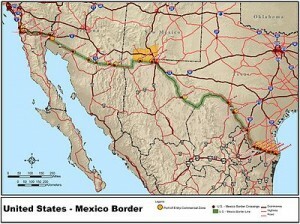 Napolitano said she has reached out to national security adviser James L. Jones, Attorney General Eric H. Holder Jr. and local and state law enforcement officials to review ways to assist Mexican law enforcement; stop the flow of guns, assault rifles and cash from the United States into Mexico; and identify areas in which more resources might be needed. Posted: 2/26/09 at 8:48 AM under News Story.